SAN FRANCISCO (AP) — The margin for error is exceedingly small for a sailor sitting three stories above San Francisco Bay on the side of a high-tech catamaran, as it leans toward the water — literally flying along the surface like a giant stingray, at 40 mph. It doesn’t take much for these top-heavy craft to topple: It’s already happened twice in these waters since October. 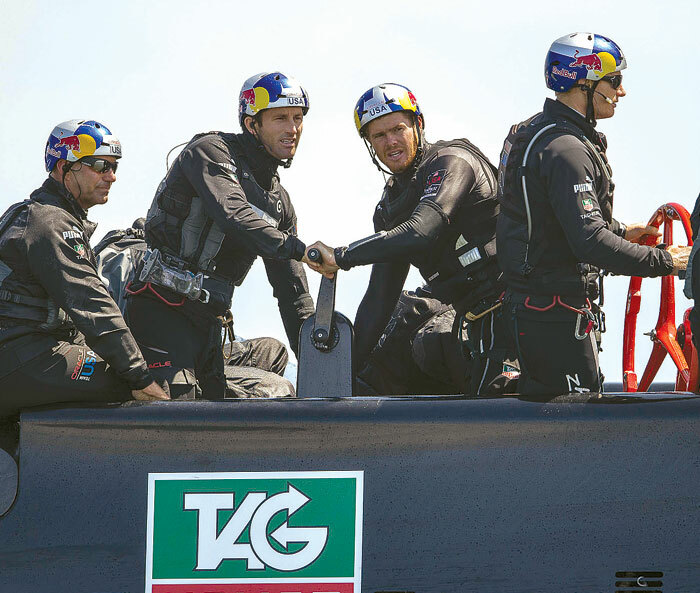 That’s why these America’s Cup sailors are suited in padded body armor and crash helmets. It’s the reason they carry emergency oxygen tanks. The days of tanned sailors in Top-Siders, baseball caps and shorts furiously changing sails amid a spaghetti mess of line are long gone. They’ve been replaced by billionaire Larry Ellison’s made-for-television vision of fixed-sail yachts equipped with cutting-edge technology, controlled by professional athletes who rely more on computers than line. Following the recent death of Andrew “Bart” Simpson, who was trapped underwater for more than 10 minutes after one of Swedish team Artemis Racing’s two boats capsized during an America’s Cup training run on San Francisco Bay, even more safety gear is being mandated. And it is gladly being donned by sailors, some of whom privately predict more capsizes and crashes before a Cup winner is crowned in September. New safety regulations have been proposed that address capsizes at length and ease competitive rules, in favor of assisting a capsized yacht. The number of round-robins in the first round of sailing among the challengers has been reduced from seven races a series to five. On May 24, three of the four America’s Cup entries took to the water for the second day of practice runs since Simpson’s death. Each of the 72-foot catamarans on the water was followed closely by an armada of chase boats carrying scuba divers, doctors and other support personnel, in case one of the space-age vessels capsized. No one was hurt when Oracle Racing’s yacht capsized in October, but it required millions of dollars in repairs after its sail was destroyed. Since Ellison’s boat won the last America’s Cup in 2010, the Oracle Corp. founder designed the race course and boats that would compete this summer. When he unveiled the plan to race some of the world’s fastest sailboats on a tight course between San Francisco’s iconic Alcatraz Island and Fisherman’s Wharf, he had hoped as many as 12 challengers would sign up to face him. Only three materialized. Those who passed said they were put off by the cost and the complicated specifications of the catamarans, powered by airplane-like wings instead of traditional flapping sails. Each boat costs upward of $10 million, and three of the four teams built two yachts. Each team employs about 100 full-time workers at waterfront bases, equipped with giant cranes and other heavy equipment to move the boats from their storage berths to the water and back again for every training run. Dalton promised to simplify the next America’s Cup, if his team’s derisively dubbed “sailing billboard” for all of its NASCAR-like advertising beats Ellison’s boat in September. “We don’t have a billionaire backer,” said Team New Zealand spokesman Hamish Hooper. The team is the only America’s Cup entry to receive government backing, with lawmakers in sailing-crazed New Zealand chipping in about $32 million — about one-third of the cost of supporting a team. The other three teams are backed almost entirely by a single wealthy funder: Ellison pays for Oracle Racing, Swedish oil magnate Torbjörn Törnqvist backs Artemis Racing and Prada owner Patrizio Bertelli funds Luna Rossa Challenge.